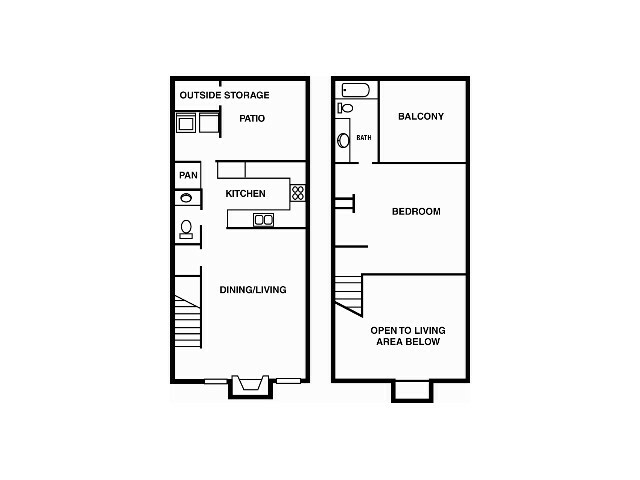 One bedroom loft features an open living/dining area, large kitchen, patio with storage. Your bedroom is a loft on the second floor with a private patio and full bath. No stairs to worry about - this apartment has ground level access. Wrap around kitchen with open access to visit with guests and family. Built-in microwave, range, refrigerator with icemaker and dishwasher are all included. In addition to the great cabinet space, a large pantry is included too. High ceilings with two skylights that let in plenty of natural light. Great exterior storage space for your stuff!